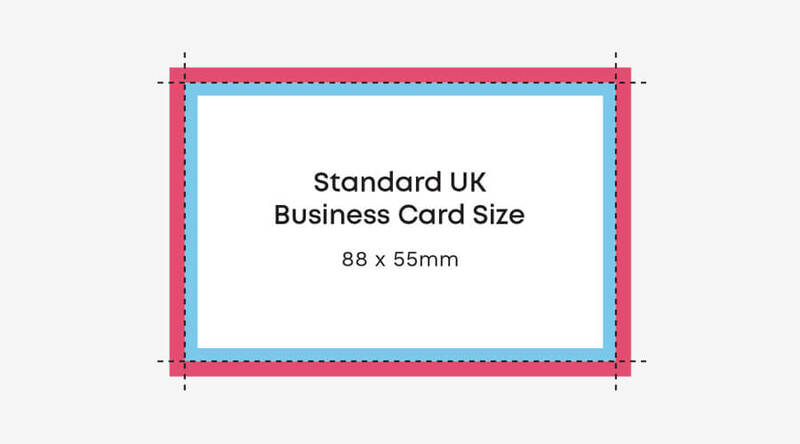 The standard dimensions of a business card in the UK is 85mm x 55mm (or 8.5cm x 5.5cm). This will be the finished, printed size of your card and is also the same size as a standard credit or debit card, meaning it’ll fit perfectly in your wallet. Making sure your business card is a standard size for your country is highly beneficial. It means it’ll fit perfectly into your business card holder without damaging the corners and will slot into your new contact’s wallet easily too. 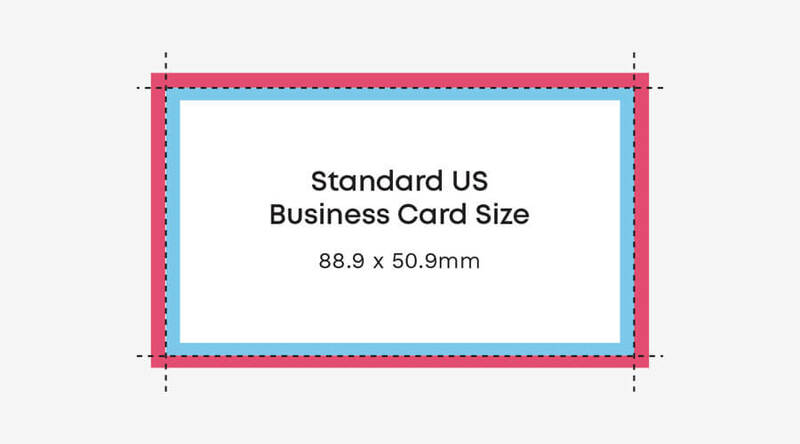 Here’s a quick guide to choosing a business card size. Standard business card size in the UK is 85mm x 55mm (or 8.5cm x 5.5cm). When uploading your artwork for print, you’ll be asked to supply it with a ‘bleed area’. In the UK, bleed is an extra 3mm added to each side to allow for cutting to make sure your design runs to the edge of the document. 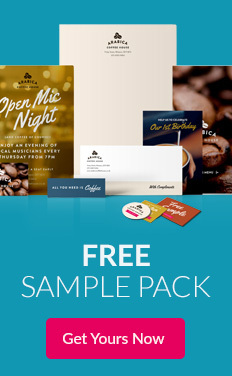 Without this, you’ll risk having a white border on your business card design. To make your own business card design with bleed, set your artwork dimensions to 91mm x 61mm. This is also the European standard business card size. The finished, printed size of a standard business card in the US is 3.5” x 2”. This equates to 88.9mm x 50.8mm when using the metric system. Like in the UK, you’ll need to add bleed area to your design if you’re planning on getting it professionally printed. Bleed is 1/8th of an inch. Make sure you keep all your important information well within the bleed zone to ensure it isn’t snipped off after printing. Your finished artwork size with bleed will be 3.75” x 2.25”. Standard business card sizes in Canada are the same as the US. 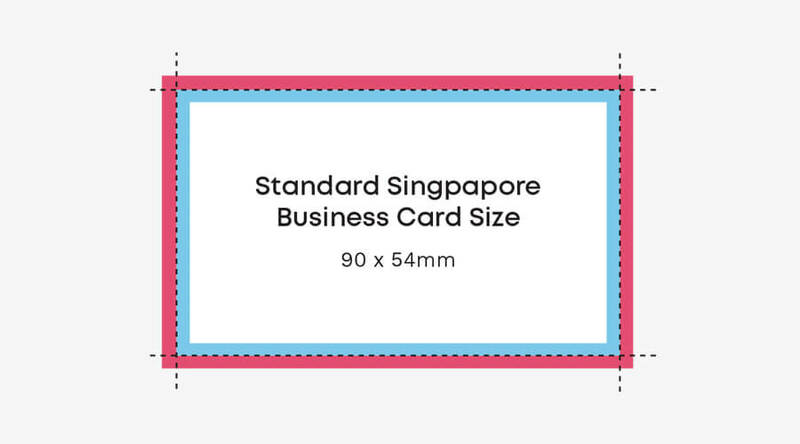 The business card size used in China, Hong Kong and Singapore is 90mm x 54mm, which is slightly wider and shorter than the European standard business card size. Again, you’ll need to add 3mm bleed to each side of your design to avoid a white outline appearing around your design. The finished dimensions of your artwork with should be 96mm x 60mm. Although business cards from around the world have different dimensions, they should all fit in a standard wallet or business card holder. Here are a few tips for how to effectively hand out your business cards. You never know when you’ll come across a contact who needs the help of your business. Keep them in your wallet or a holder in your bag/pocket for when the opportunity arises to introduce yourself and your business. By using professionally printed and designed business cards, you’re showing that you care about your business and how you present yourself. It’ll also vastly improve your chances of getting a call back from it. Here’s everything you need to know to create a professional business card. 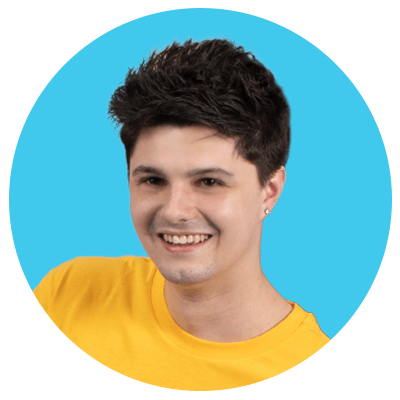 Get to know a little bit about the person before handing out your business card. Building rapport is a great way of making a memorable impression. Your business card will then be used to remind them of you and allow them to get in touch. Whenever you hand your business card out, ask for one in return. As well as being good etiquette, it shows that you’re interested in the other person and will make them feel important. To get maximum exposure from your business cards, you’ll need to think outside of the box when it comes to distributing them. Including them in customer orders, tying them to balloons or jars at events and making the most of these fun hacks are just a few ways of using business cards creatively. Keep note of who you’ve handed your cards out to, and after a few days send a message to them. You could connect with them on social media, send them a link to your business page or just let them know that it was a pleasure to meet them. Now you know the standard size of a UK business card, all that’s left to do if design your own. 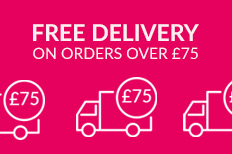 Check out our free designs page and customise them to create your own. We’ve already added the bleed and safety, so all that’s left for you to do is add your contact details. Show us your finished printed business cards on social media by tagging us @instantprintuk or #instantprintuk for a chance to be featured.